Request a quote for a bulk order for CRISPR/Cas9 polyclonal antibody. Please fill out the form here below. Your local sales account manager will get in touch with you shortly and send you a quotation based on your requirements. Polyclonal antibody raised in rabbit against the Cas9 nuclease (CRISPR-associated protein 9) using a recombinant protein. * Please note that the optimal antibody amount per IP should be determined by the end-user. We recommend testing 1-10 µl per IP. I used ChIP-qPCR with the Diagenode CRISPR/Cas9 polyclonal antibody to successfully show that Cas9 binds to the target region of my sgRNA, validating my CRISPR experiment. The antibody produced minimal background signal at non-specific genomic regions. I am now using the antibody to validate further sgRNA in different CRISPR cell lines. 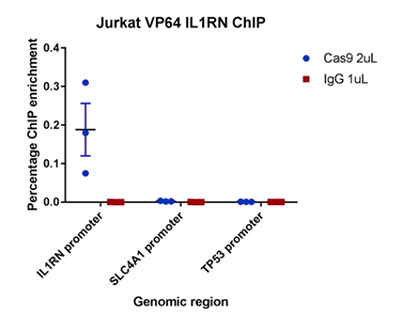 ChIP was performed on Jurkat cells expressing dCas9-VP64-mCherry and a sgRNA targeting the IL1RN promoter. Each IP was performed using 4 million cells and 2 µL CRISPR/Cas9 polyclonal antibody (Diagenode C15310258) or 1 µg rabbit IgG control antibody (Diagenode C15410206). qPCR was carried out on undiluted ChIP DNA using SYBR green and PCR primers directed against the sgRNA binding site at IL1RN, as well as two non-target regions at the SLC4A1 and TP53 promoters. ChIP enrichment was measured using the percent input method. ChIP was performed on NIH3T3 cells stably expressing GFP-H2B, nuclease dead Cas9, and a GFP-targeting gRNA. 50µg chromatin was incubated overnight at 4°C with either 5 µg of an anti-FLAG antibody or 2 µl of the Diagenode antibody against Cas9 (Cat. No. C15310258). 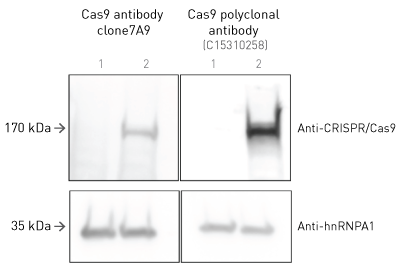 The pre-immune serum (Cas9, PPI) was used as negative IP control. qPCR was performed with primers specific for the GFP gene, and for two non-targeted regions phosphatidic acid phosphatase type 2C (Ppap2c) and protein kinase C delta (Prkcd), used as negative controls. Figure 5 shows the recovery, expressed as a % of input (the relative amount of immunoprecipitated DNA compared to input DNA after qPCR analysis). 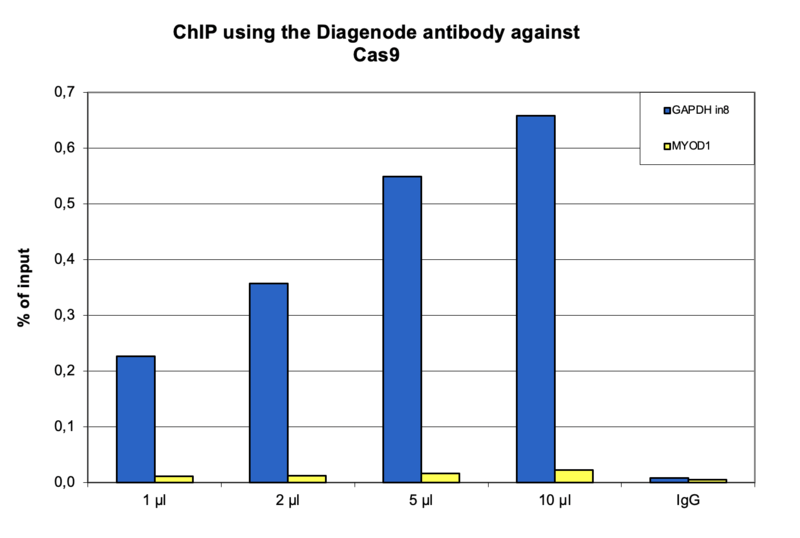 ChIP was performed on sheared chromatin from 4 million HEK293T cells stably expressing dCas9 and either an H19 or a GAPDH sgRNA cells using 5 µl of the Diagenode antibody against Cas9 (cat. No. C15310258) and the iDeal ChIP-seq kit for transcription factors (C01010055). The IP'd DNA was subsequently analysed on an Illumina HiSeq 3000. Library preparation, cluster generation and sequencing were performed according to the manufacturer's instructions. The 50 bp tags were aligned to the human genome using the BWA algorithm. Figure 2 shows the ChIP-seq profile of the H19 and GAPDH transfected cells in a region of chromosome 11 surrounding the H19 gene (fig 2A) of chromosome 12 surrounding the GAPDH gene (fig 2B) and in a region of chromosome 2 surrounding an off-target peak obtained with the GAPDH sgRNA in the YIPF4 gene. 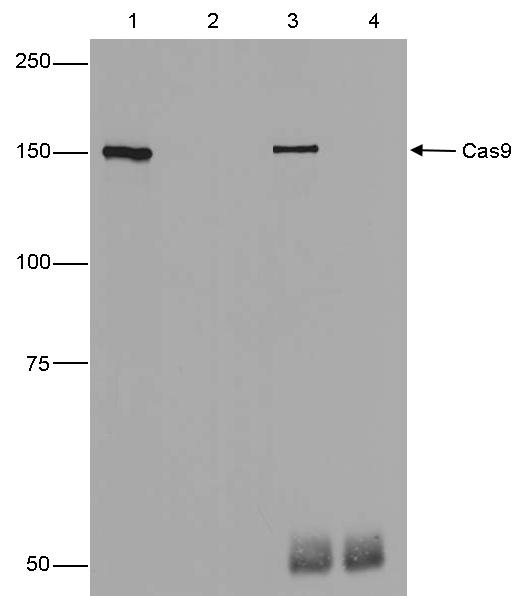 Western blot was performed on protein extracts from HeLa cells transfected with Cas9 using the Diagenode antibody against CRISPR/Cas9 (cat. No. C15310258). The antibody was diluted 1:1,000 (lane 2) or 1:5,000 (lane 3). Lane 1 shows the result with the pre-immune serum. The marker is shown on the left, the position of the Cas9 protein is indicated on the right. IP was performed on whole cell extracts (500 µg) from HeLa cells transfected with a Cas9 expression vector (lane 1 and 3), or untransfected cells (lane 2 and 4) using 1 µl of the Diagenode antibody against Cas9 (cat. No. C15310258). The immunoprecipitated proteins were subsequently analysed by Western blot. Lane 3 and 4 show the result of the IP, the input (25 µg) is shown in lane 1 and 2. HeLa cells expressing Cas9 under the control of the tight TRE promoter were fixed in methanol at -20°C, permeabilized with acetone at -20°C and blocked with PBS containing 2% BSA. 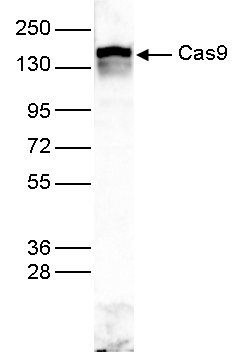 The cells were stained with the Cas9 antibody (cat. No. C15310258) diluted 1:1000, followed by incubation with a goat anti-rabbit secondary antibody coupled to AF594. Nuclei were counterstained with Hoechst 33342. Figure 5 shows the result in the presence (left) or absence (right) of doxycycline. CRISPR systems are adaptable immune mechanisms which are present in many bacteria to protect themselves from foreign nucleic acids, such as viruses, transposable elements or plasmids. Recently, the CRISPR/Cas9 (CRISPR-associated protein 9 nuclease, UniProtKB/Swiss-Prot entry Q99ZW2) system from S. pyogenes has been adapted for inducing sequence-specific double stranded breaks and targeted genome editing. This system is unique and flexible due to its dependence on RNA as the moiety that targets the nuclease to a desired DNA sequence and can be used induce indel mutations, specific sequence replacements or insertions and large deletions or genomic rearrangements at any desired location in the genome. In addition, Cas9 can also be used to mediate upregulation of specific endogenous genes or to alter histone modifications or DNA methylation. Diagenode’s CRISPR/Cas9 polyclonal antibody shows superior signal than the original clone 7A9: a researcher from EPFL in Lausanne, Switzerland has compared these two antibodies in Western blot. Western blot was performed using HCT116 DKO cells transduced with Krab-dCas9 (2) or non-transduced (1) cells. Then, 100,000 cells were lysed in sample buffer 2x and boiled 5 min at 95°C before loading in a 15% acrylamide gel. The same sample was loaded 3x in the same gel. The membrane was cut in 3 parts for each antibody. Membrane was blocked 1h with 3% BSA at RT. Antibodies were diluted 1:1,000 in 3% BSA and incubated overnight at 4°C. Secondary incubation was done for 1h at RT (1:10,000 dilution). Anti-hnRNPA1 was used as a loading control. Diagenode strongly recommends using this:	CRISPR/Cas9 polyclonal antibody (Diagenode Cat# C15310258-100 Lot# A2508-001). Click here to copy to clipboard.